Mackerel gets a bad rap. Mackerel, herring, sardines, they’re all cheap and bit on the fishy side even when fresh, so they’re not at the top of most people’s list. We’re all given the impression from celebrity chefs that mackerel is a less popular, more sustainable fish than, say, cod or sea bass and is therefore a better choice for the dinner table. The differences between mackerel and sea bass are pretty obvious, not least the price, but back in 2013 there was a scare when mackerel all of a sudden sunk into the danger zone. Just after all of us started getting on the band wagon, we were suddenly supposed to cut back on this oily, omega-3 filled fish and all its inherent goodness before we lose it forever. Now it’s confusingly listed as 2-4 on the sustainable scale depending on how and where it’s caught. Good grief. 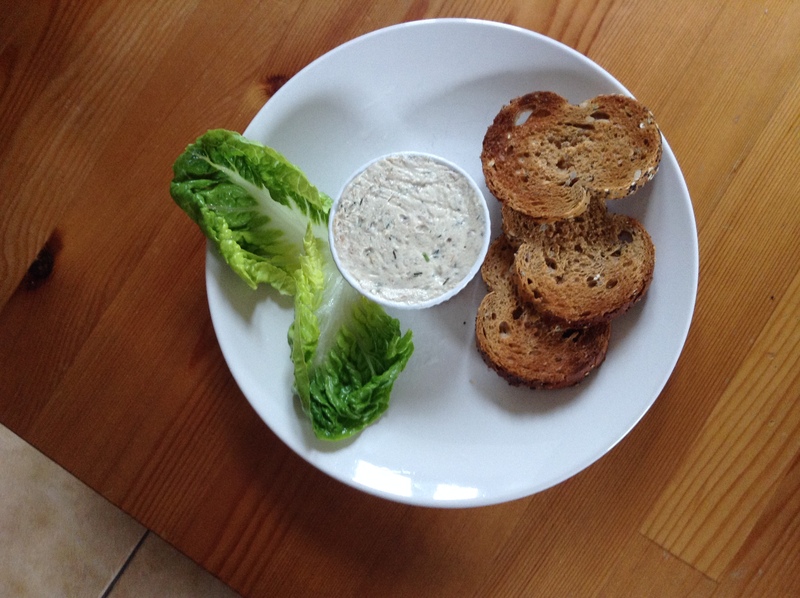 So if you can get your hands on some smoked mackerel which has been caught in the right way and in the right part of the sea, this recipe is for you! Mixed with enough cream cheese, crème fraîche and dill, even this fishiest of fishes might tempt a nonbeliever. This is the simplest thing you can do for a dinner party starter or even as a make ahead weekday lunch with some crudites or crackers. It feels luxurious, and it is, but you also know that somewhere in all that cream and cheese is an oily fish that’ll keep your heart healthy and stop your joints from creaking. As with anything though, there are downsides. We’re supposed to only eat oily fish in moderation (only about twice a week for women and up to four times a week for men) and it’s recommended only once a week if you’re a pregnant woman because of the pollutants in the fish which can build up in your body. The NHS says in its advice that omega 3 is important for pregnant women as it helps babies’ immune systems develop, but then later warns that the pollutants in oily fish can harm babies’ development later on. All this back and forth is giving me a headache. So to recap: eat mackerel, but only the right type caught in the right way. It’s good for you, except when it’s not. And, most importantly, make sure you make this recipe, just don’t make it too often. 1. Skin the mackerel fillets and check for any bones. 2. Flake 3 of the fillets into a food processor with the cheese, crème fraîche and horseradish and whizz until smooth. 2. Add freshly ground black pepper and the juice of half a lemon, then fold through the dill and flake in the remaining fish. Add more cream cheese if it’s too runny, or more crème fraîche if it’s too thick. Season to taste. 4. Serve with toast and pickled vegetables or a side salad with a sharp vinaigrette. This looks like a wonderful recipe, but I don’t keep crème fraîche or horseradish in the house. If I bought them for this recipe I would end up throwing the rest out. I suppose I will just have to imagine how this would taste. It does give me some ideas for what to do with the can of sardines I have in the pantry. You could use sour cream or natural yogurt instead of crème fraîche. And prepared horseradish would work in smaller quantities and that stays good forever in the fridge. Tom Kerridge’s turnip soup (https://acrusteaten.com/2014/01/27/meatless-monday-turnip-and-horseradish-soup/) with fresh horseradish is amazing too though if you buy fresh and have some leftover! Fabulous!!! This could be a lunch for me!!! Thanks for your tutorial on fish – especially mackerel. And thanks for the recipe. This will be another use for my stovetop smoker. Lately I have been smoking all sorts of things, and mackerel sounds like another good choice. Sounds delicious! I hope you made some for you bbq today! Nope, I made potato salad instead!